We are Ms. Benson and Ms. Fike, the BLOCK teachers from UW- Eau Claire that have been working in your student's classroom for the past two weeks. We have been working with Mrs. Dachel and Mrs. Bowe to create lessons in math, science, reading, language arts, and social studies. Ms. Benson has even been teaching some daily American Sign Language! We have been enjoying our time at St. Peters immensely and have been having so much fun teaching various lessons. In science, we have been exploring the cell and its different functions. For reading, the 6th graders learned how to compare and contrast using Venn Diagrams. In 5th grade language arts, students are learning about direct quotations and their punctuation. 6th grade math has been working on ratios and rates. Ms. Benson has been teaching the beginnings of ASL, such as the alphabet, numbers, and other common signs! In the next coming weeks, we will begin our social studies unit, exploring ancient Egypt and the Nile Valley. The 5th graders will also begin learning how to multiply decimals in math. We appreciate the opportunity to work with the students and teachers at St. Peters, we are learning so much! We hope you have a safe Thanksgiving break, we are looking forward to coming back! We have been very busy this September. Charles celebrated his birthday September 8th. On September 11th the whole school had cupcakes for Mary's birthday. Later that day we had a prayer service for the remembrance of 9/11. Bryce celebrated his birthday on September 12th. We had our first science test and now we are learning about our solar system. We have been making posters for science and social studies. We are very thankful that Mrs. Wahl has been coming in and teaching us how to sing in Spanish. Mr. Normand has some snakes that he brought in to show us. We are so thankful that we have Mrs. Dachel as our teacher. Where did the summer go? After 94 days of summer vacation we are back. The first couple days back we got ready for the year. The fifth graders got comfy with moving up to Mrs. Dachel's classroom. The first Friday back we celebrated John's Birthday. We are studying the Ten Commandments in religion. The fifth graders had Mrs. Bowe for the first time and are looking forward to math. Our class had Starlab about the moon. Starlab is a portable planetarium that teaches kids about our galaxy. The 3-6 graders went to Farm- City Day at the Seibel family farm. There we learned about organic farming, the benefits of bees, tractor safety, to buckle up with the Chippewa County Sheriff, robotic milking, and had a guided tour of the farm. These first weeks were amazing and we're looking forward to many more. Happy New Year! We've already been busy in 2018. We have been excited to begin our Festival of Nations project. We're already learning a lot and we've only begun researching our flags and their histories. This week we've begun the Scripps National Spelling Bee in our classrooms. Next week we'll find our who our school winner/representatives will be. In religion we're learning about the beginning of Jesus' ministry when He was baptized in the Jordan River by John the Baptist. During social studies, we've been studying the late 1800's including the building of the transcontinental railroad, the growth of the oil and steel industries and immigration. We've read about these things and have watched videos about them too! We've been using microscopes in science class when we've been looking at plant cells. Fifth grade students are adding and subtracting with fractions while sixth grade students are learning how to write and solve algebraic expressions. 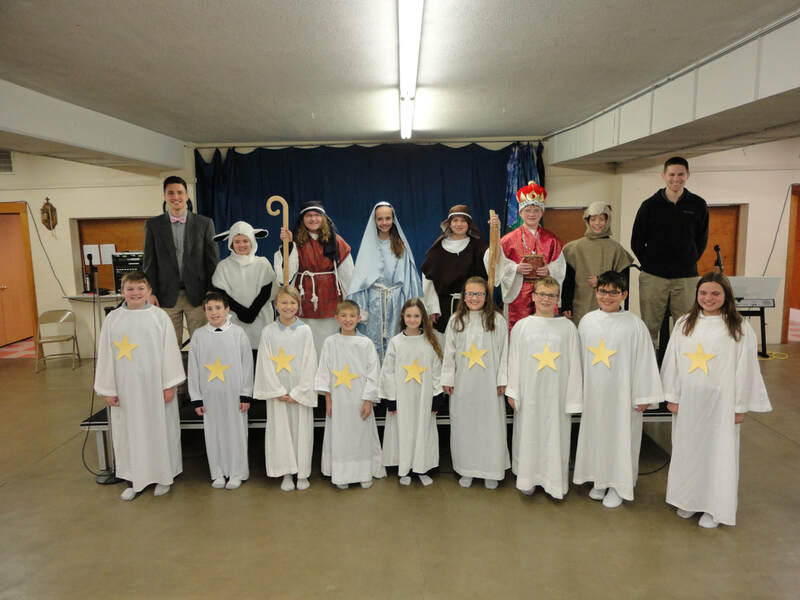 This week the students have been working fervently both in the classroom and on their Christmas program. In the classroom the students created treaties after learning about them in Social Studies. The students had so much fun with these! Contents of the treaties ranged from negotiating extra recess time with Mrs. Dachel to an agreement with the Block teachers to stay at the school. Creative writing was also a blast as the students got creative by writing their own story about one Christmas wish that came true. The creative writing stories ranged from becoming ninjas, super heroes, and taking trips to warm and sunny exotic islands. Every afternoon the students went to the church basement to work on the ever anticipated Christmas play. Singing and dancing filled the church basement (even the Block teachers joined in!). Although the Block teachers wrap up their teaching at St. Peter School today, the students, staff and parents have enjoyed their presence at the school. The Block students from University of Wisconsin-Eau Claire have been back with us the past three weeks, teaching lessons and helping with day-to-day activities! Yesterday, we started writing our own creative pieces with the prompt "If you had one wish for Christmas, what would it be and what would you do with it?" We will be revising, editing, and self-publishing them next week! We have been hard at work practicing for our Christmas program each day. The songs, acting, props, and costumes are really coming together! We started a new book called The Best Christmas Pageant Ever and we have found some similarities and differences between the story and our own school's Christmas performance. We hope to see you at the show next Sunday, December 10, at 12:45 p.m! The month is flying by! We are busy with researching the lives of saints that we will be dressing up as for All Saints Day. In addition, we wrapped up our conservation speeches by sharing them with the whole school on October 20. Some parents and grandparents also came to listen to our speeches. Earlier in the month we had the Living Rosary in honor of Our Lady, Mary. In Science, we made cells with jello and other kinds of food. Each type of food represented a different part of the cell. We are learning what the function of each part of the cell is. The Tilden Volunteer Fire Department visited us earlier in the month. We were able to see a bunch of the different equipment that they use when they response to different emergencies. This week we got block teachers, Mr.Benson and Mr.Lee. We got a substitute teach Mrs.K because Mrs. Dachel needed to go to some meetings. We also had a field trip. We went to the conservation trip at Lake Wissota State Park. We learned about groundwater, solar energy, wildlife, wetlands, and recycling. In science lab, we made a diagram of a cell with jello, grapes, a pepper, peas, a button, and orange slices.We also had computer lab on the same day as science lab. We worked on our leaf project which is due on Friday October 6. Last week we had a gym class, and we played volleyball. We also had no school on Friday. We practiced our speeches. We are doing our leaf project. We took our chapter 3 test in reading. Block teachers are coming today. We did a science experiment. This week we started current events, and we had our first class with Mrs. Wild. We also had our first reading test. We had our first Religion test and our first spelling test. On Friday we had Mass with Father Miller. After Mass, we went to the church basement and celebrated Mary's birth. We had good cupcakes and punch. Then we came back to school and had more cupcakes for Charles's birthday. We had our first phy-ed class with Mrs. Bowe. We are excited to share with you what we have been doing in class.